Hi there!! My When we were young series has had a couple of months off due to Christmas and other things, but today I am back to share another nostalgic inspired creation. This month, Victoria from As it seams in England is sharing. Victoria is a journalist who loves to sew! She sews mostly for her daughter. She made this great outfit for Secret Squirrel and is also hosting a lovely series at the moment called, Take one dress. I am taking part in this series in April and I am excited! I was born in Edinburgh, the beautiful capital city of Scotland. It was a great place to grow up. In the summer it has the world's biggest arts festival, and I had the opportunity to see lots of amazing art, music and theatre. My mum was an art teacher and my dad an architect, so making things was part of our family life. I have a twin sister and a younger brother. Yes. I live in a beautiful part of southwest England, about 300 miles from my family in Scotland. I miss them and Scotland, but have found a good place to be! I live in a small market town, with hills just minutes walk away, with Mr As-it-Seams and my eight-year-old son, Torin and my little girl, nicknamed Missy who is nearly four. I've been thinking and planning my contribution to Suz's When We Were Young series for months. In fact I've been pondering a contribution since last summer, I had so many ideas. 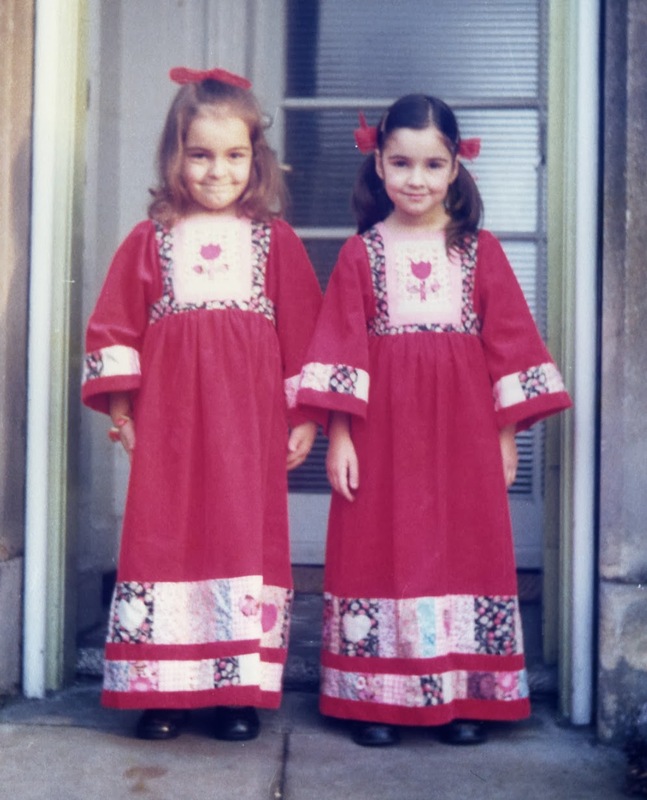 When I was little, in the 1970s, my mum sewed everything for me and my twin sister. And I mean everything: summer dresses, coats, school uniform, seventies style dungarees (overalls), even my sports kit for school. She sewed two of everything, usually in different colours. Talking to her now, I realise that her sewing was very different from mine. I sew because I love to create something new. She sewed from necessity. She simply could not afford to buy new clothes for us. Today, with imported, mass-produced clothes on sale so cheaply, sewing has a different place. But I digress...On a visit home I flicked through the family albums. There were a few possibilities. 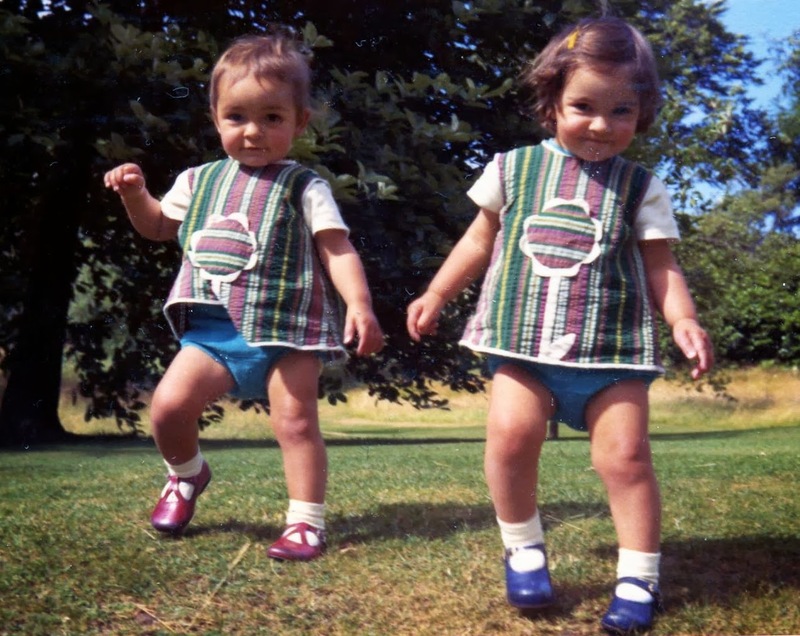 These adorable little tunics in colourful seersucker. (I'm on the right). I love the opposing stripes and white trim. Or these matching floral puffed sleeve dresses. Another Tinny dress perhaps? Yep.... I don't have a rational explanation - but this photo was calling my name. And, I actually have this dress. 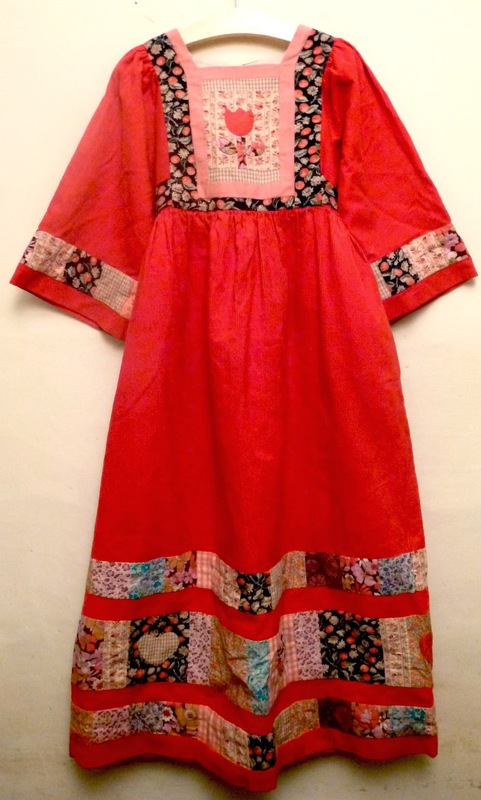 I can hold it, see my mum's stitching, gaze at the patchwork of sought-after vintage Liberty prints. My mum made two of these ! And you can see that she lengthened them. 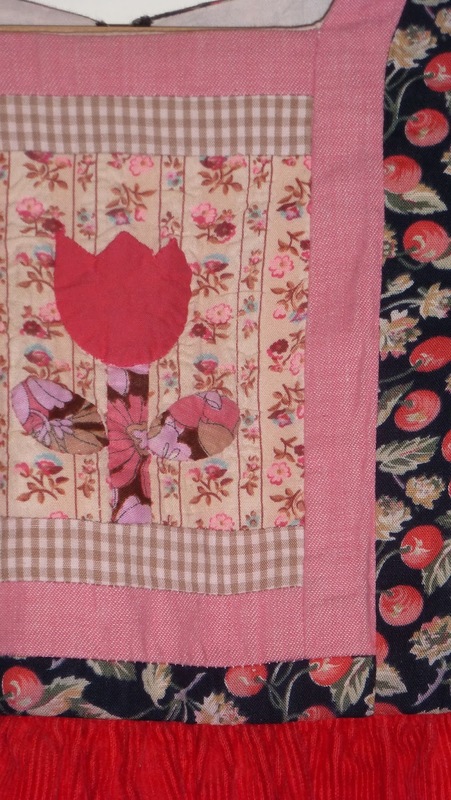 In the picture there are two rows of patchwork, the dress now has three - she added an extra tier as we grew. Three decades later I would follow her exact sewing journey, as a way of connecting generations. Several nights of research followed, and then ...hurrah.... 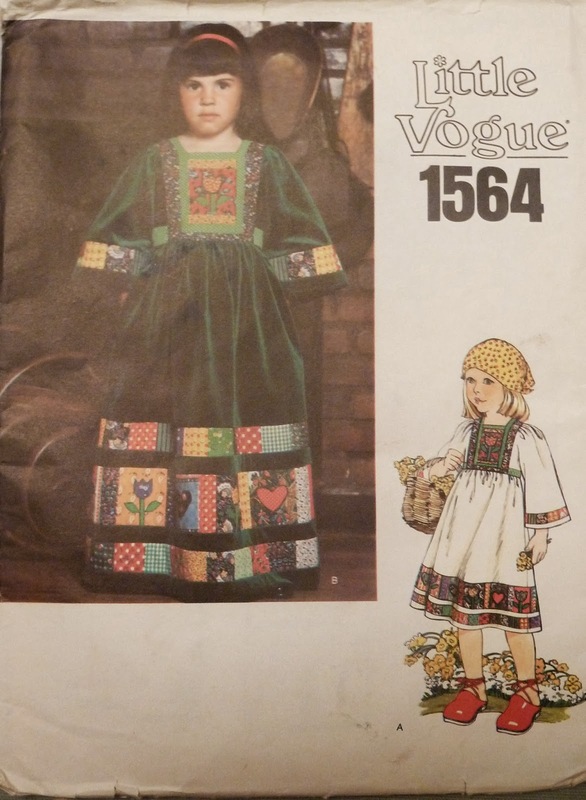 I found the exact 1970s Vintage Vogue pattern on sale in Canada. With just a few clicks of a mouse it was winging its way across the Atlantic. But I didn't want to create the exact same dress - that seemed pointless, seeing as I actually have this dress. I wanted to make an alternative vision - view B on the pattern. Something summery and light, floaty and pretty. 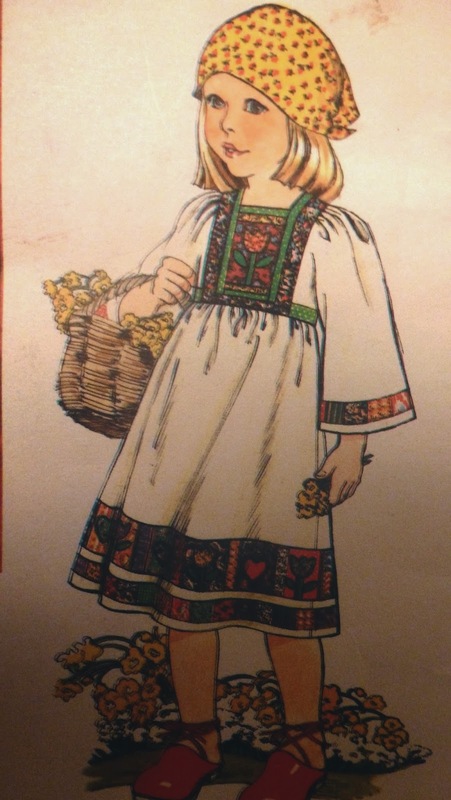 My vision was a dress that screamed summer, for wearing while running through butter-cup filled meadows. Crisp, fresh, pretty. More evenings were filled with internet research - then I stumbled on this cheater patchwork linen/cotton blend from Ness Home, bought from Miss Matatabi. Clever me, I thought smugly - Cheater Patchwork print will save me a lot of work. It didn't in the end - as I had to cut all the pieces, but it did mean that all the colours of the patches co-ordinate. The only additional fabric is a scrap of Jeni Baker's Nordika in the blue print around the neckline. Which print should go where? I kid you not, this dress has occupied my head more than any sane person should admit. I decided to give the ice-cream print pride of place on the front. And ditched any idea of an applique flower. I also wrestled with making a white dress - it seemed foolish. But in the end, irresistable. I wanted a fresh look, and nothing else seemed to work. Missy looks good in white - but I know it's going to look grubby very quickly! 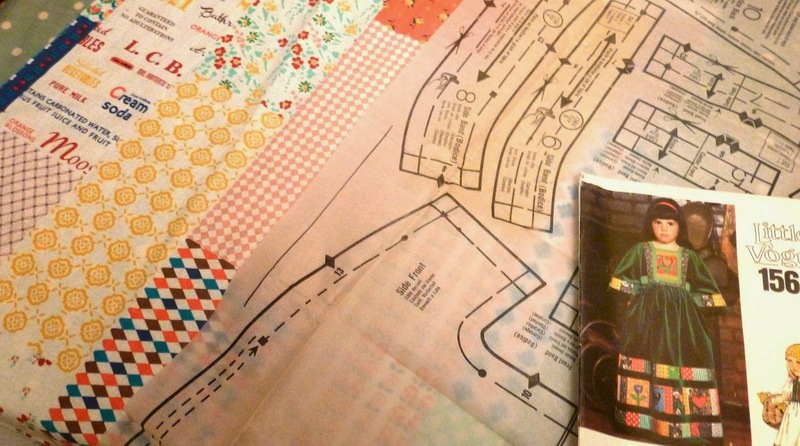 Sewing up a Vogue seventies pattern meant a return to traditional sewing skills. All those tailors chalk marks, and remembering the 'language' of patterns. But it was all actually very straightforward, apart from inserting the zip, when the only instruction was 'insert zip.' My mum's dress has the zip enclosed behind a casing. Mine is an exposed blue zipper. The pattern has the transfers for the applique flowers and hearts, but forgive me, I just couldn't face doing that too. 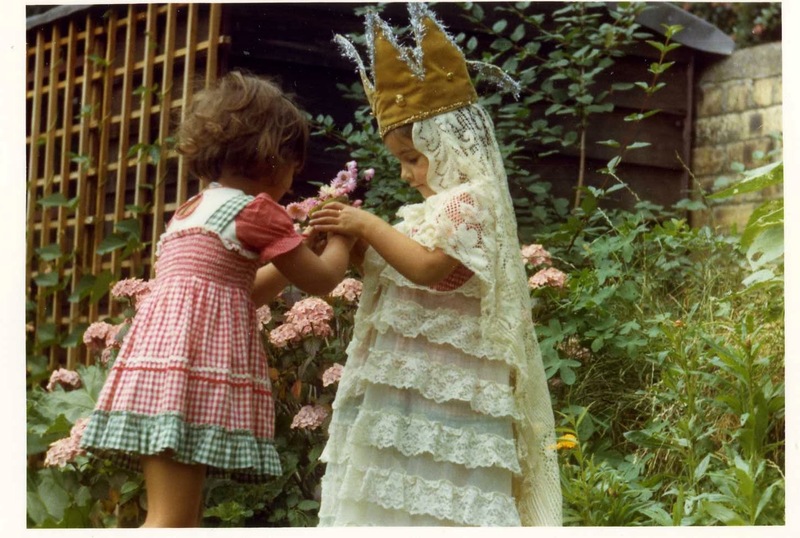 (My mum clearly had the same lapse in enthusiasm - there are no tulips on my dress). I also made only one tier of patchwork on the skirt. Two seemed over the top. This dress is a size 6, it's big and long on Missy. The kimono sleeves, while lovely, are very impractical. I have a plan to unpick them completely and reshape as little flutter sleeves, but that's another story (or blog post). There were so many things about this project that are a bit crazy. An over-priced 40-year-old paper pattern?! A white dress?! Sewn in winter?! During the weeks of hideous storms, gale winds, mud and floods everywhere here?! Photographing a white dress?! Indoors, on a feverish grumpy child, with a fairly basic camera ?! Wow! Thank you so much Victoria!! Such great history and replication of the outfit and the process. It's gorgeous!! 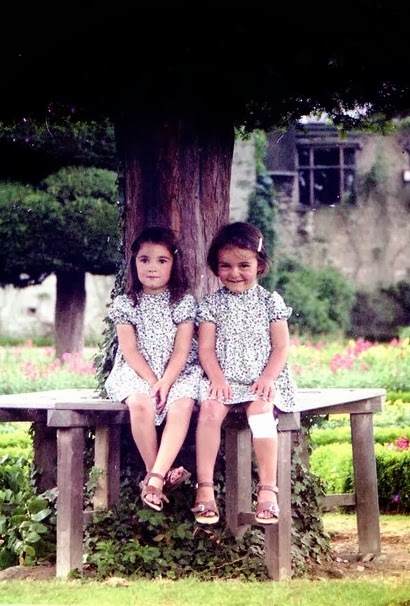 You are also very lucky to have such great photos of yourself and your sister when you were young. Thanks so much for sharing today!! That is amazing. Well, a bit crazy, too ;) but still amazing. A really beautiful dress and even if she won't wear it that often it will be one of the dresses that you will keep as a heritage. Victoria, I admire the fact that you got the same pattern your mum used. I seriously cannot imagine you sewing something plain and straight forward. This dress is very special and I hope 30-something years later Missy will be looking at it, smiling imagining her mum making something so special for her. Thanks so much for your awesome creation Victoria! Thank you Victoria's mum! So nice to hear your comment!! Spectacular! The prints, the colors, ... So 1970s! Really amazing work. What a special dress, Victoria! 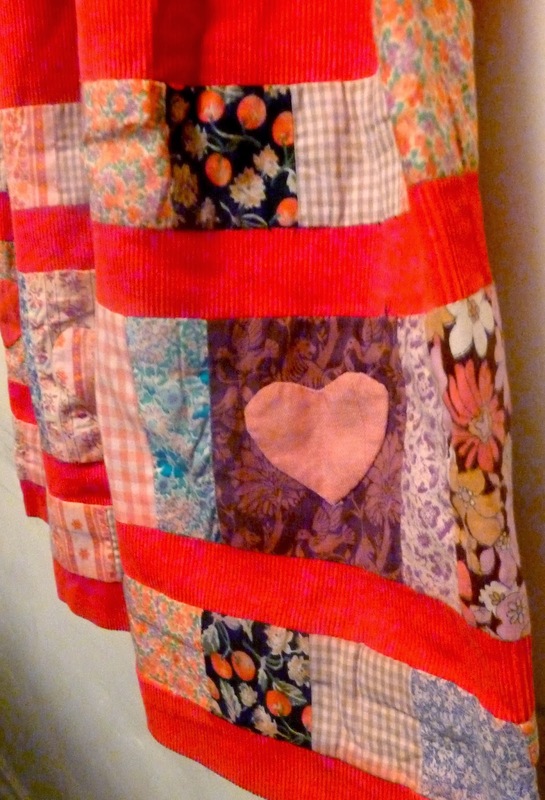 And I love how your mom added a tier of patchwork as you grew. How resourceful! What a lovely story, your heart gets all warm and teary eyes!!! I love this post!!! I am SO happy that this wonderful series is back! It is funny because I started writing an email to you in mid February asking if this series would be back (it was never sent though...) and a few days later here it is!